It won’t always be obvious when your chimney needs repair. In fact sometimes the signs that a chimney needs a little work are hard to see and can only be found when you’re looking for them directly. Knowing what to look for can help you spot issues quickly and before they develop into costly, time consuming repair projects. Damaged chimneys are also a fire hazard so they should be inspected and repaired regularly for the safety or your property and family. You can start your chimney inspection inside the house. Look at the wallpaper that is located in areas close to the chimney. If it is damaged, discolored or tearing, there could be excessive moisture in the chimney. If too much water or condensations gets into the chimney it can affect the structural integrity as well as surrounding pieces of foundation or décor. Water causes all sorts damage to materials from drywall to wood to wallpaper, as it can be the reasoning behind expansion, contraction or disintegration. Next, take a look inside the chimney, at the bottom. This area should only be full of wood or ashes, nothing else. If you find that there are small or thin pieces of chimney tile, this can be a sign of damaged chimney liner. When this liner cracks or splits, the chimney is no longer safe to use. These small pieces of liner can built up and turn a normal, contained fire into a house fire. If you utilize a stainless steel chimney liner instead, which typically have a lifetime warranty, you are not at risk for this problem. The next part of the inspection should be done from the roof. If you can safely get onto and off of your roof to look at the chimney, you can do this yourself. While you are on the roof you want to look for damaged mortar joints. These will be located between the masonry of the chimney and allow moisture to enter the bricks. Moisture will cause the bricks to expand, contract and enlarge the cracks. Furthermore, if a substantial amount of water gets into the cracks and the bricks for a long period of time, the entire chimney is at risk of collapsing. While you are on the roof you should also pay careful attention to the chimney crown. This piece of the chimney can protect the entire structure from the weather and climate. When it is in need of repair, water can get into all the different parts of the chimney and wreak havoc on the structure and strength. You might also want to consider weatherproofing your chimney crown to protectively protect it. 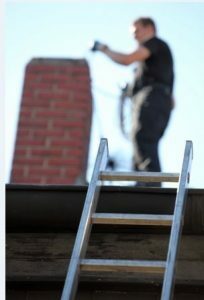 If it is unsafe to do so you can hire professionals to come out and test your entire chimney for damage or danger.